Use list.files() to create a subsetted list of file names within a specified directory on your computer. Create a raster stack from a list of .tif files in R.
Plot various band combinations using a rasterstack in R with plotRGB(). You will need a computer with internet access to complete this lesson and the data for week 7 of the course. In the previous lesson, you learned how to import a multi-band image into R using the stack() function. You then plotted the data as a composite, RGB (and CIR) image using plotRGB(). 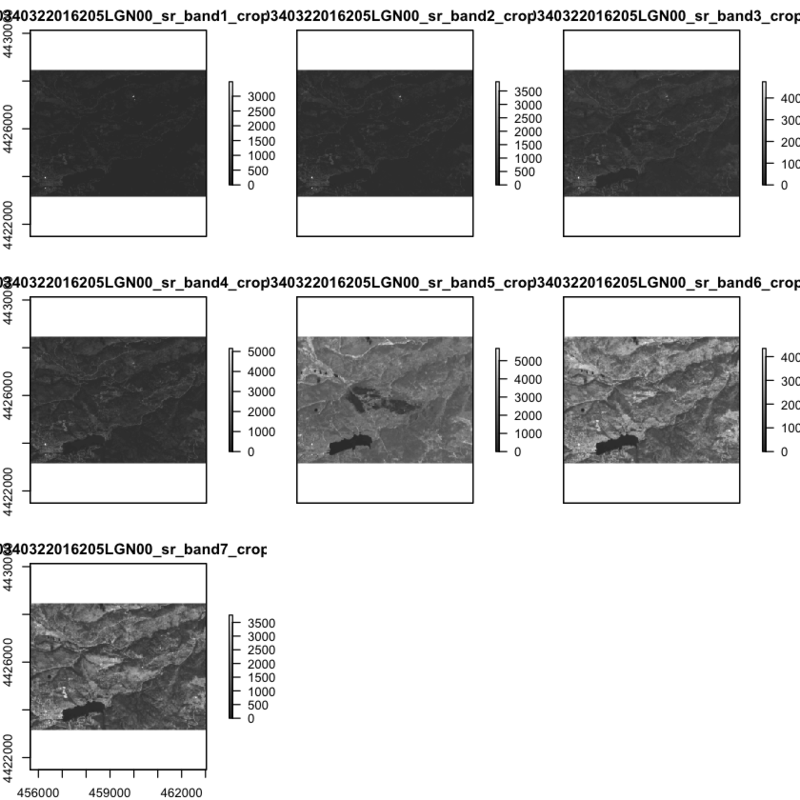 However, sometimes data are downloaded in individual bands rather than a composite raster stack. 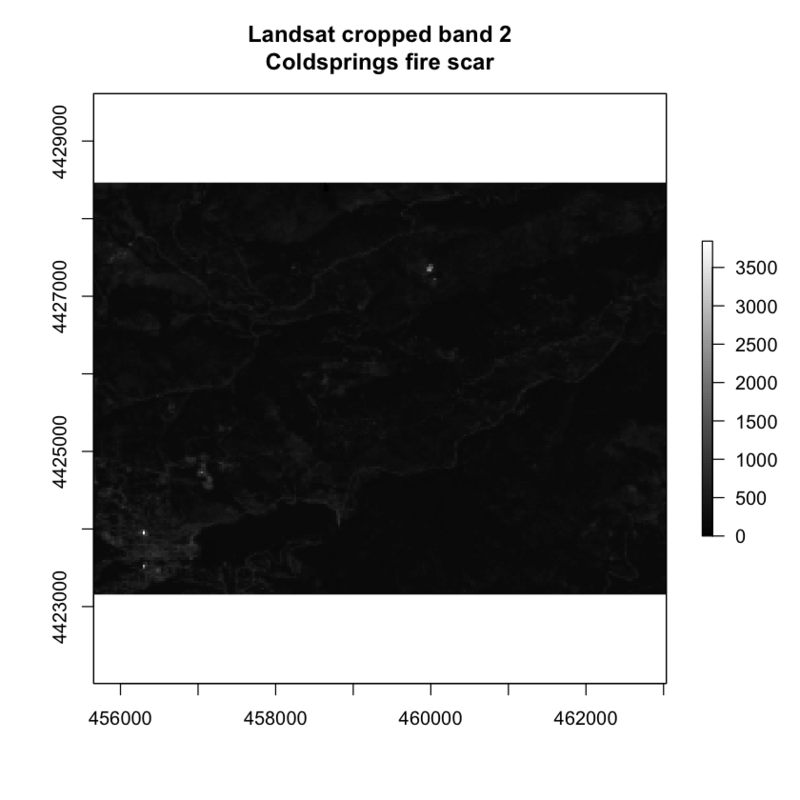 In this lesson you will learn how to work with Landsat data in R. In this case, your data are downloaded in .tif format with each .tif file representing a single band rather than a stack of bands. 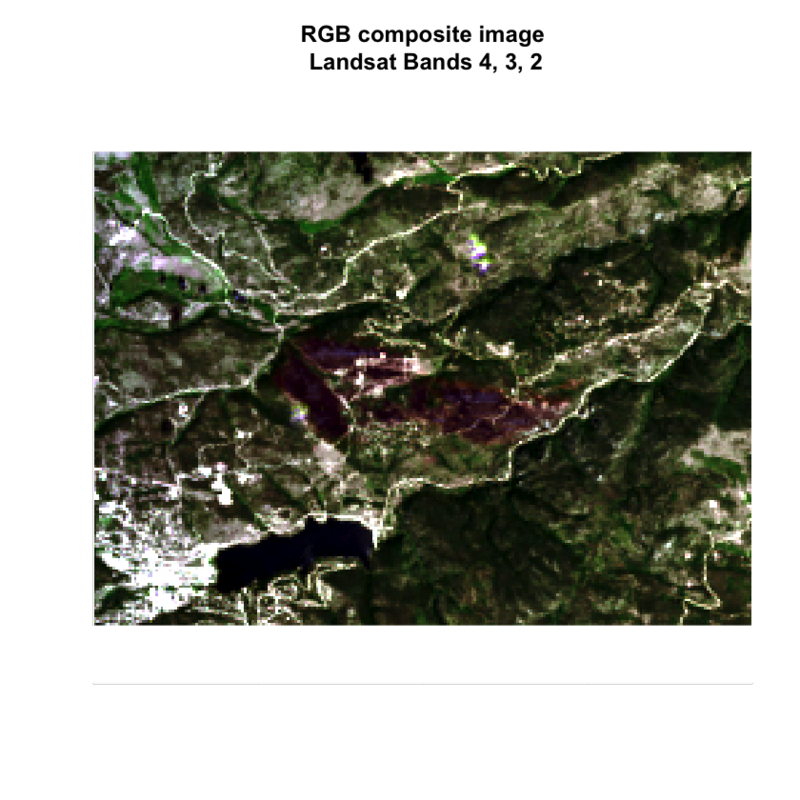 Landsat data is a multispectral dataset, collected from space. 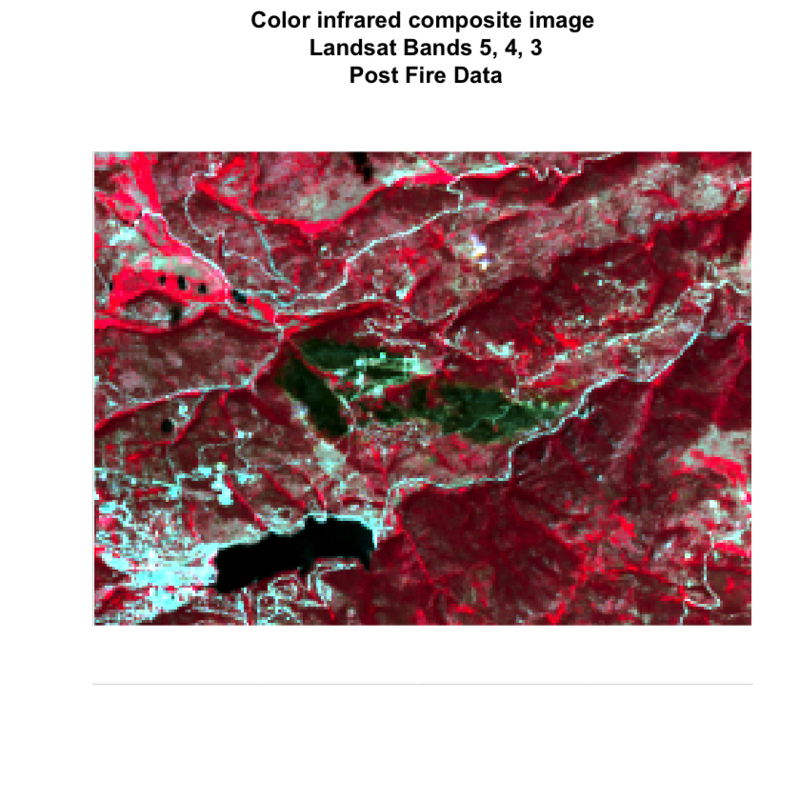 The multispectral bands and associated spatial resolution of the first 9 bands in the Landsat 8 sensor are listed below. When working with Landsat, it is important to understand both the metadata and the file naming convention. The metadata tell you how the data were processed, where the data are from and how they are structured. The file names, tell you what sensor collected the data, the date the data were collected, and more. Let’s have a look at one of the files and use the image above to guide us through understanding the file name. More here breaking down the file name. In class, we won’t spend a lot of time on Julian days. For the purpose of working with Landsat and MODIS data, what you need to know is that the calendar year Julian day represents the numeric day of the year. So Jan 1 = day 1. Feb 1 = day 32. And so on. There are several links at the bottom of this page that provide tables that help you convert Julian days to actual date. Next, you can open the Landsat data in R.
If you look at the Landsat directory for the week_07 data, you will see that each of the individual bands is stored individually as a geotiff rather than being stored as a stacked or layered, multi-band raster. Why would they store the data this way? Conventionally Landsat was stored in a file format called HDF - hierarchical data format. However that format, while extremely efficient, is a bit more challenging to work with. In recent years USGS has started to make each band of a Landsat scene available as a .tif file. This makes it a bit easier to use across many different programs and platforms. You have already been working with the geotiff file format in this class! 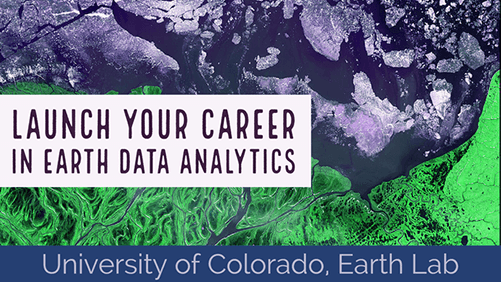 You will thus use many of the same functions you used previously, to work with Landsat. To begin, let’s explore your file directory in R, You can use list.files() to grab a list of all files within any directory on your computer. You can also use list.files() with the pattern argument. This allows you to specify a particular pattern that further subsets your data. In this case, you just want to look at a list of files with the extension: .tif. Note that it is important that the file ends with .tif. So you use the dollar sign at the end of your pattern to tell R to only grab files that end with .tif. Above, you use the $ after .tif to tell R to look for files that end with .tif. This is a good start but there is one more condition that we’d like to meet. We only want the .tif files that are spectral bands. Notice that some of your files have text that includes “mask”, flags, etc. Those are all additional layers that you don’t need right now. You just need the spectral data saved in bands 1_7. Thus, you want to grab all bands that both end with .tif AND contain the text “band” in them. To do this you use the function glob2rx() which allows you to specify both conditions using what is called regular expressions. A regular expression is a sequence of characters that defines a search pattern. Here you tell R to select all files that have the word band in the filename. You use a * sign before and after band because you don’t know exactly what text will occur before or after band. You use .tif$ to tell R that each file needs to end with .tif. Now you have a list of all of the Landsat bands in your folder. You could chose to open each file individually using the raster() function. However, that is not a very efficient approach. It’s more efficiently to open all of the layers together as a stack. Then you can access each of the bands and plot / use them as you want. You can do that using the stack() function. Let’s plot each individual band in your brick. Next, let’s plot an RGB image using Landsat. Refer to the Landsat bands in the table at the top of this page to figure out the red, green and blue bands. Or read the ESRI Landsat 8 band combinations post. Be sure to add a title to each of your plots that specifies the band combination.